Unifor President Jerry Dias declined to comment about why the union decided to not move forward with an escalation of protests against GM. 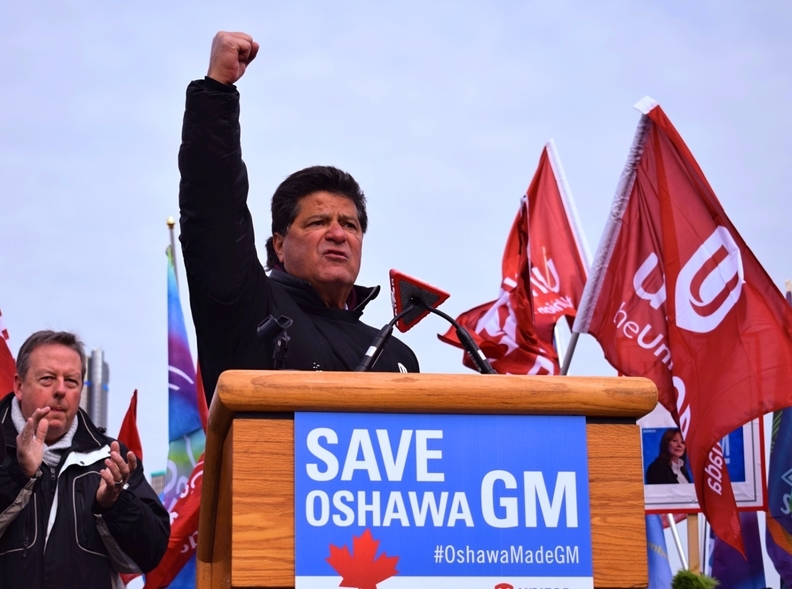 Unifor cancelled a Friday news conference where it planned to detail a “significant escalation” in its fight to save General Motors’ Oshawa, Ont., assembly plant. Almost a full day after Unifor announced the cancellation on Thursday night, it still is not clear why the news conference, scheduled for this morning in Toronto, was cancelled. Unifor on Thursday promised a “significant announcement on the escalation” of its Oshawa campaign. Union spokeswoman Kathleen O’Keefe said in a statement that the union would have “no further comment” on the cancellation. Unifor President Jerry Dias declined to comment, and a request for comment from David Paterson, GM Canada vice-president of corporate and environmental affairs, was not returned. The cancellation is the latest wrinkle in the ongoing GM Oshawa saga. Following meetings with the federal and provincial governments earlier this week in Detroit, GM reiterated that it would end production at Oshawa by year’s end, rejecting a call from Ontario Premier Doug Ford to extend the plant’s life at least until the end of its contract with Unifor in September 2020. GM CEO Mary Barra on Monday met with Navdeep Bains, the federal economic development minister, to discuss the Oshawa plant, among other matters. In a statement, Bains said GM was making a “mistake” by closing Oshawa but said Barra did not back away from her plans. Those plans, announced in November and aimed at saving GM US$6 billion (C$7.96 billion), also include un-allocating production from two assembly plants in Michigan and Ohio. GM said the moves are necessary to get ahead of the curve before the next downturn, though the automaker has come under fire from politicians and unions on both sides of the border. Speaking at the Automotive News World Congress in Detroit on Wednesday, Barra said she “understands” the uproar GM’s plans have caused. “We've really tried to do a difficult step, a step that we had to do for the long-term success of General Motors,” she said. The affected plants were frequent topics of discussion this week at the Detroit auto show and the World Congress. Magna International Inc. CEO Don Walker, for instance, said the supplier would take a look at Oshawa if it secured large enough deals from automakers to build their vehicles. Its Magna Steyr unit builds vehicles under contract for automakers in Austria. "If we had four or five customers that said, 'I'll give you 20,000, 30,000, 40,000, 50,000 vehicles,' and we got that up to 120,000 to 150,000 vehicles, then we could have a plant, either build a greenfield or buy a brownfield,” Walker said at the World Congress. “It really depends what our customers want." The Oshawa plant builds the Chevrolet Impala and Cadillac XTS and does final assembly on previous-generation Chevrolet Silverado and GMC Sierra pickup bodies shipped from the United States. GM said it will axe all four models from its lineup as part of its restructuring plan.